If you have ever watched 'Biggest Loser' or gone to your local gym, you may have seen people sport a band around their arm that isn't a ipod holder... ever wonder what it is? I did, and was very curious to find out more. 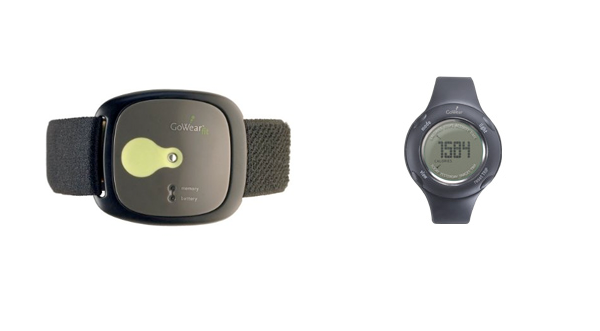 In my research along with reestablishing my new year fitness goals, I learned about the Body Media "GoWear Fit" system and it has been one of the best fitness products I've ever tried. You wear the trusty armband around your arm and it collects data that you can view on an optional accompanying watch and their online activity manager. It scientifically tracks how many calories you are burning each day, your activity levels, how many steps you are taking and even your sleep efficiency. I am amazed by its accuracy! It is an excellent technological tool to help you see and statistically manage what your body is really doing each day. Couple your activity with filling in your calories on their online manager and you are set to see results. It has shared with me that I really need to boost my metabolism. Amazon carries the GoWear Fit and you can also find it here. It is a great tool to jump start and help assist keeping those health and fitness resolutions. Just bought a pedometer recommended by Jillian Michaels. Wish I would have seen this before! So many more functions! I have had the body bugg for almost a year. It is fantastic. Easiest way for me to know how much I can afford to eat. I have lost and kept off 60 pounds. It counts my calories burned, steps and minuets at moderate activity. If only it was a heart rate monitor then it would be an all in one fitness item. That's not actually the one that the biggest loser people use. They use the Bodybugg armband. I have been using the Bodybugg and have lost a lot of weight using it. It's fantastic and the software is amazing. Hi Leni -- The Bodybugg is extremely similar to the BodyMedia GoWear Fit. They are both made by the same company (BodyMedia) and one of the main differences is the Bodybugg is partnered and licensed with 24 Hour Fitness. wow I never knew these existed, look awesome. Wonder if they ship to NZ will have to check it out! I just got mine today and already have it charged and strapped to my arm. I am so excited! I recently lost almost 40 pounds and this is my way to be sure I keep it off.